Maasai warrior Club Penguin is about more than the snowy online world of adorable virtual creatures, which your children are probably mad about. A portion of the profits of this game site goes to support educational and humanitarian work in Kenya, partnering with Free the Children. Recently Disney Online Studios, which owns and operates Club Penguin, named Janine Roth of Kelowna, B.C. as volunteer of the year — and sent her on a Kenyan tour. Roth is both an employee of Club Penguin and a volunteer in Kelowna. “I love the holistic approach to humanitarian aid,” said Roth, after returning from her 12-day tour of Kenya during the summer. With a group from Free the Children, Roth toured schools that had been build in southwest Kenya. She met many people; saw alternative income projects; helped with things such as bead work; visited a tree nursery; helped at the first secondary school for girls that Free the Children had built; and even took a little training. “These are the warriors known for wearing bright red and for jumping very high,” noted Roth. 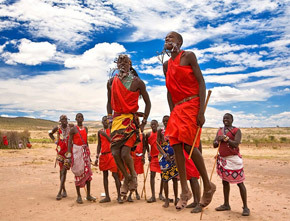 The group stayed with the Kenyans at Maasai Mara, and the Maasai warriors toured with them as guides and protectors — always wearing red, and carrying their machetes.